Blog for September and October 2017 During September we focused on our training ready for myself and Fulltide’s second competition together, working on areas that we think are our weak spots. As Fulltide has only been with me a short time we are still developing her strength and way of going, however she is a lot stronger and more established in her ways of going now. We practiced lots of centre lines making sure we are straight the whole way down with no noticeable wobbly parts, as well as our halts being straight. I have also been practicing my turns on and off the centre line making sure the flow smoothly with no handbrake turns or sharp corners, so we have been using the feeling of riding a half 10 meter circle which has really helped with my accuracy in turning onto the centreline. I have also been working on the position of my hands as I tend to carry my left hand a lot lower than the right so I have been working on carrying them in the same position to make sure the bit and contact is equal on both sides. Our next area to work on has been the medium trot which is a working progress and Fulltide still needs to develop her strength and establish that medium trot means to take a bigger stride rather than just going quicker or cantering. To help with the medium trot we have been using two exercises. 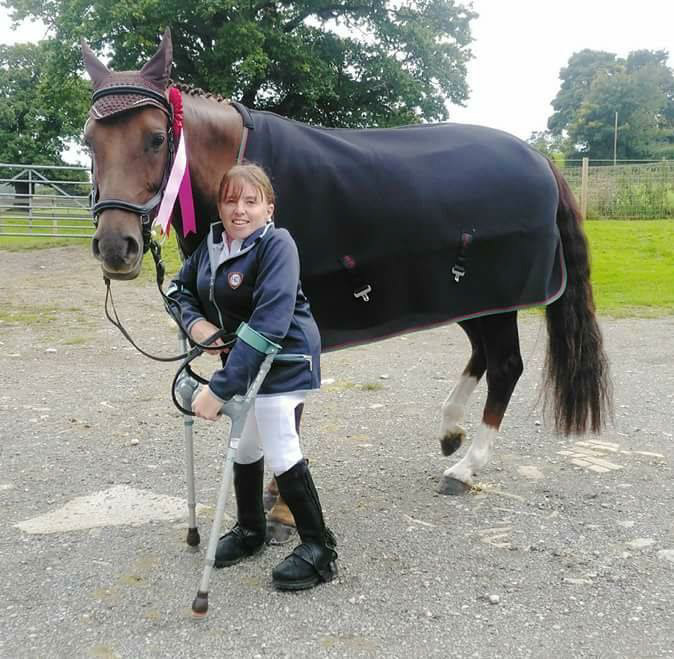 The first one is riding a square within the school and collecting the trot for the corners then asking for a few medium trot steps on the long side before collecting her back up for the corner, this has helped establish the ‘go’ and ‘back’ aids as well as encouraging her to sit more. The second exercise is to ride shoulder-in riding out of the corners and half way up the long side, then straightening her up and then asking for a few medium trot steps. Both this exercises have helped a great deal. We have also been working on the leg yielding which we seem to be having a few technical difficulties with moving into my weakest side but with practice it is improving all the time, we just need to take our time and ride one step at a time. At our second competition, Fulltide was a little more aware of where she was and she was a little excited to be out again, although saying that she was still very well behaved considering it was her second time at a competition. We warmed up indoors were Fulltide was feeling great, I gave her plenty of time to walk around and settle before picking her up, so I used lots of transitions to make sure she was listening and once she was warmed up practiced the test movements that we would be riding keeping in mind what Helen had taught me in my lessons. It was soon our turn to make our way to the outdoor arena where we would be competing. Fulltide was feeling a little on her toes as we entered the arena and was a little frightened of some sand bags which were just outside the arena – the judge very kindly led us past as I couldn’t get her going forwards as she froze on the spot – it is hard without a leg aid and it was the wrong time to back my voice up with a tickle of the whip but she was soon listening again and ready to compete in her first dressage test of the day. In our first dressage test she was a little tense but listened to everything I asked of her and worked very well. Before our second test we had a little time to go through the movements in our next test and to also take the opportunity for Fulltide to relax. It was soon our turn to ride our second test of the day, she was much more relaxed and happy. I was very pleased with her overall attitude and she tried her absolute hardest for me. We scored 69.13% and 69.85% to be placed first and second. I gave Fulltide a few days off after her competition as we had been really busy fitting in as much training as possible. During October we have had our regular training lessons with Helen and Fulltide is improving all the time. I have also been working on our canter which we learnt last month, before that I had never cantered intentionally. The canter is improving all the time and we are now able to work on movements rather than just cantering down the long side. I have been using the canter work to encourage Fulltide to work from behind which has improved our trot a great deal. As well as our training and schooling I have been keeping Fulltide’s work varied so she doesn’t get bored of doing the same thing – we have been doing some trotting poles and small jumps which she thoroughly enjoys.